We all wish we had more of it. No matter how early we start, or how fast we work, it always seems we need more hours in the day. On some level, you know this is true. You know that’s what you should be doing. Posting 1, 2, even 3 times per week. But you’ve fallen behind. Today, I’m going to show you how you can easily whip up a brand spanking new blog post in as little as 15 minutes. <Start with the intro… Something like "Jenny's interested in putting her home on the market but she's not sure where to price it…"
Write your list post… What are some reasons you might price this home at “x” amount. Once you’ve gone through those steps, you’re set to hit publish! What other questions are clients and prospects asking that you can provide answers to? Hint: Check your email, you’ve answered several of them already! Like this post? Subscribe to The Diverse Solutions Blog today! Cool idea…and efficient too. I am still working on my calendar (you suggested the plug in). I have written posts through July and am into August. First one published today. Good on you! If you’re well into August, I think you’re even ahead of me, heh. 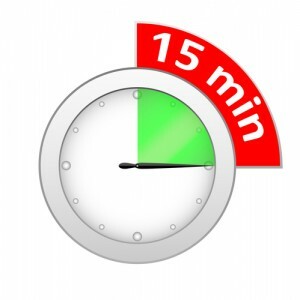 15 minutes a day is a small price to pay to have a content rich site. I have been making about 1 blog post per week, but I could step it up a little. Maybe I will. Personally, I use a timer and write in 12-15 minute increments daily. I shoot for 500+ words per day. I don’t always publish everything. But the timer, and the list of post ideas keeps the juices (the content) flowing.